Are you prepared for an emergency? These kits are for the home or car. They contain items that you will want to have with you should an emergency occur. They are often called emergency, 72-hour, earthquake, or disaster kits. These kits are custom designed and manufactured by B&A Products. These kits are housed in a sturdy back pack for portability. The BASIC kit contains the minimum important items and intended for you to add those items that you particularly want or need. The SURVIVOR is fully loaded. Detail contents list of the 3 kits. You are welcome to use our list to build your own emergency kit. Or, take the easy way and order one from us. 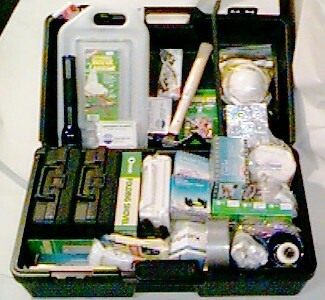 Parts information availability and pricing.Full Information and Instructions sheet for the Back Pack Emergency Kits.